Found this in my grandmother's garage inside an old preheat strip light.... I'm gonna replace it with some random modern tube. Wow! Must be 1950s if it says rapid start only. Color is Cool Green. I'm glad to be stumbling onto so many rarities and good tubes! My collection only has one ALTO tube in it. And don't get me wrong I don't mind Philips ALTO's but I like the fact that I can gaze upon my pile of tubes and only see one of them lmaoo the rest are all oldies and goodies for the most part..
LOL, I have a bunch of certain ALTOs like CWP (741) and DX (965) heh. Half of my 4ft collection is modern tubes while the other half is all goodies! Rare ones I have are some Duro-Test Vita-Lite powertwists and Duro-Test 40w Vita-Lite Double Cathode lamps from that abandoned house last year that I saved from destruction. I've got lots of both F40/DX Altos as well as older things like Mainlighters. FYI, DX is /965. @ace: Duh! I had a brain fart moment LOL. I really like the etch on this lamp... Once I get back home I will compare its color to my service greens! That's really cool. Looks like it may be made by Duro-Test. Preheat and T-12 fluorescents forever! 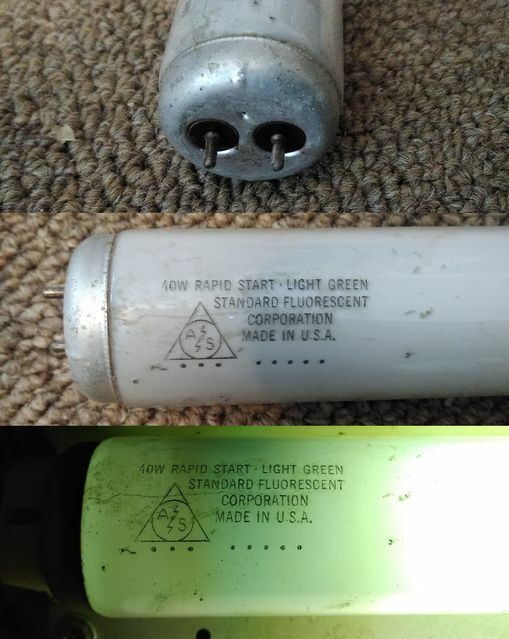 Down with LED's and instant start T-8 fluorescents. Really cool lamp and etch. Never seen that brand before. You’re doing well in your lamp hunting adventures.